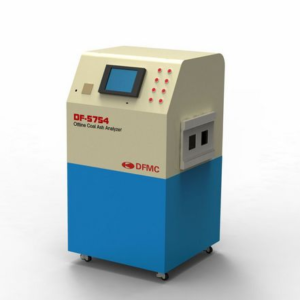 DF-5703 (A) online neutron activation coal analyzer is one kind of cross-belt type coal material Online detection equipment, with momentous significance in coal mining, coal washing, coal blending, blending of coal putting into the furnace, production process control, etc. 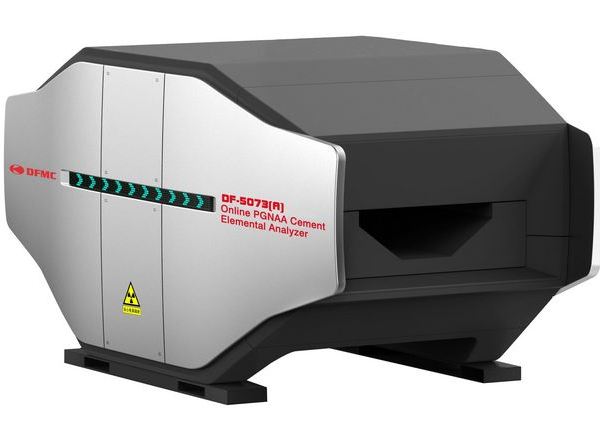 DF-5703(A) can present the testing results every one minute, thus accurately analyzing the content of each element as well as relevant industrial indexes. 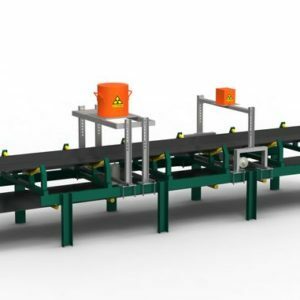 It carries effective monitoring on coal quality, with such features as no need to take samples, full material analysis, high analysis accuracy, etc., which has efficaciously solved such problems as lagging coal testing data, etc. According to the real-time detection information and in combination with the process control system, it can conduct effective control on the production process, improve production technology, reduce production costs and raise product quality. 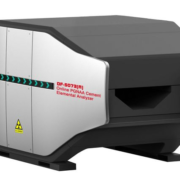 DF-5703(A) adopts prompt gamma neutron activation analysis (PGNAA) technology. The neutron source emits rapid neutrons with average energy at 2.35Mev, which are then degraded into thermal neutrons by the measuring unit. The thermal neutrons radiate materials, so that the thermal neutron capture reaction can be made among the nucleuses of various elements in the material to emit characteristic gamma rays with different energies and intensities. By testing the energy in characteristic gamma ray, the element categories in the material can be distinguished, and by testing the intensity of gamma ray with specific energy, the content of element can be got. Measurement parameters: ash content, moisture, sulfur content, SiO2, Al2O3, Fe2O3, CaO, MgO, Na2O, K2O, etc. Calculation parameter: calorific value and any possible parameters that can use empirical equation. DF-5703 (A) system can be used jointly with the process control system, so as to classify and pile the raw coal and commercial coal after washing in time. 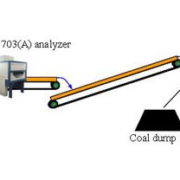 For coal washeries, it can sort the coals with higher calorific capacity to the maximum and improve quality coal output; for power plants and coal chemical plants, it can classify and pile the coals by quality, so as to facilitate subsequent stable coal blending. 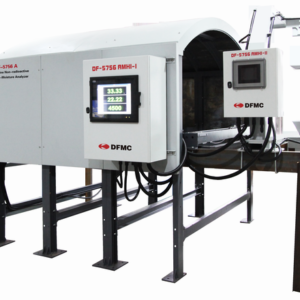 DF-5703(A) can be used jointly with the automatic batching software to carry out the optimized control during the coal blending course. Weighing instrument and analyzer can send current detection results into the batching software, and the latter then presents the optimization formula to control the feeding amount of each raw material feeder according to the target values of quality control parameters (calorific value, sulfur content and ash content) as set up by the users, so as to make the batching satisfy the quality control requirements. The batching software can also adopt manual mode. The feeding amount of each coal source can be controlled through the intercommunication system, thus guiding coal blending. •With one professional service team of one hundred members engaged in product research and development upgrade, production, installation and commissioning. •All the components determining the performance of the online analyzer are imported from professional manufactures in the world. •The optimized software algorithm has stronger adaptability to site environments and is better for quality control and the central control personnel to carry out operation and management. •The radiation protection of the device is designed strictly in accordance with international standard. The materials with strong ability in absorbing rays are adopted, and the shielding body is thick, thus making the use more reliable and safe. •The company has nearly twenty years of experience in the development and protection of nuclear detection instruments for industrial use. •The company has the radiation safety qualification certified by the state. The company provides all-round, timely and effective service. For equipment, lifelong technological service will be provided; for software, lifelong upgrade will be provided free of charge. 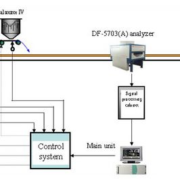 By now, DF-5703(A) coal analyzer and its similar products have successfully entered into such domestic large power and cement groups as China Huadian Corporation, CNBC Cement Group, Jidong Cement Co., Ltd., China United Cement Corporation, etc.